This is one of my favorite quick lunches – just reheat and eat! 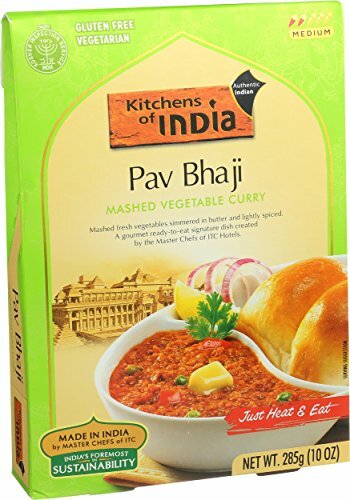 Pav Bhaji is a type of mashed vegetable curry made primarily of potatoes, tomatoes, and peas blended with butter, ginger, and spices. Like many Indian vegetarian dishes, it is richly flavored and savory enough to be a hit with both vegetarians and meat eaters. The ingredient list for Kitchens of India’s version of the dish is refreshingly short (just 10 ingredients) and doesn’t require a chemistry degree to understand, which is always a bonus in my book. I like to eat it by itself or with bread or naan for lunch, but it would also make a great side dish for an ethnic meal. If you’re on a diet, you will want to be a little careful of the serving size – this is not a low calorie food. The pouch it comes in contains approximately 2.5 servings of 210 calories each, so if, like me, you tend to eat the whole thing in one go, you’ll be consuming about 525 calories. Kitchens of India’s Pav Bhaji is spicy, but not eye-wateringly so. I’d put it about a 2-3 on a scale of 1-10. That’s just about the right level for my taste, but of you love spicy foods, you may want to add more. Conversely, if you’re sensitive to capsicum, skip this one.